Hello ... Hello ... my old friends ... It's great to see you once again! It really was a pleasant surprise to be contacted by independent Finnish Power Pop and rock recording artiste Esa Linna earlier this week. Esa kindly forwarded me his latest album "This Is Who I Am" [Castello Recordings; 22/02/13] to have a listen to on behalf of ELO Beatles Forever [ELOBF]. "She's not a human being, She doesn't like Jeff Lynne ..."
"The lyrics of "She's Not A Human Being" are very simple, silly and very tongue-in-cheek. At first, I was going to write a first love song for my wife [back in 2006, when I recorded the first demo of the song] but as married couples often do, we had a strong argument about something [that] I just can't remember. The love song was not an option at the time, so I wrote the lyrics about our cat instead - REVENGE! There is a glimpse of truth in the words - she didn't always like the loud guitar playing and there is a maple tree on the front of our house. And of course she was hairy all over the place and her eating of little birds was not so fun to watch. I am talking about our cat here, not my wife! The Jeff Lynne -reference is there because I had to have a somewhat matching rhyme, and also I am a fan of Jeff Lynne's work - mostly in The Move, ELO and Tom Petty records. 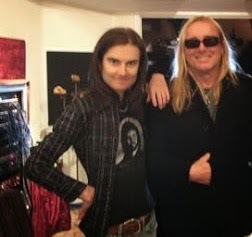 So the reference is there because it's a homage to Mr. Lynne and I think Roger Joseph Manning Jr. [on backing vocals & keyboards] understood it that way too - just look at the T-Shirt he's wearing in this photo!" ELO Beatles Forever [ELOBF] recommends "This Is Who I Am" by Esa Linna to those enlightened folks who also like ELO, Jeff Lynne, Roy Wood, 'Brum Beat', The Idle Race, The Move, The Beatles, Tom Petty and related artistes.